This is one ingredient we have no trouble finding around the Irish countryside. Did you know that any recipe with spinach can be replaced with nettle? In fact, nettle beats spinach and broccoli for vitamins and minerals. 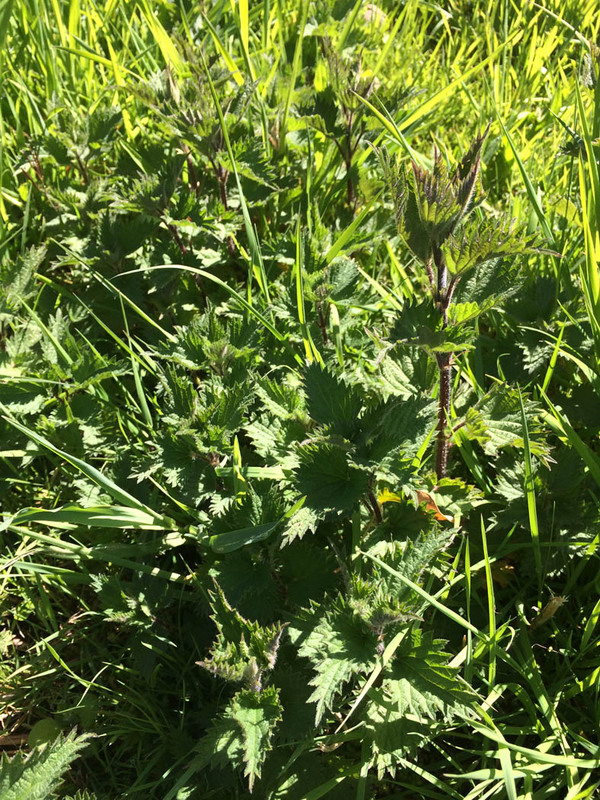 So if you catch yourself short on greens, a short trip to the fields with a pair of gloves to pick the tips of young nettles (first 4 to 6 leaves) – is the way to go. Late March, April or early May are the best months to gather but don’t use them if they have started to flower as the leaf becomes too coarse to eat. (Thankfully!) 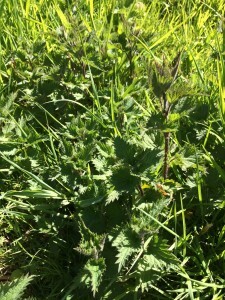 once the nettle plant is cooked, it loses its stinging properties. 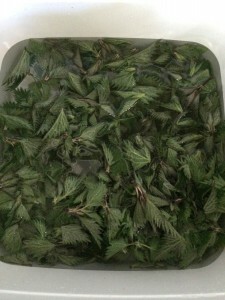 Nettles are delicious when steamed or boiled and served with butter, salt and pepper. They are rich in chlorophyll and contain high amounts of vitamins A, C, E, K, and even vitamin D. They are also an abundant source of minerals, especially calcium, magnesium, silicon, sulpher, zinc, potassium, phosphorous, cobalt and copper. This makes it a ‘Super’ food, great for all types of illnesses, especially anaemia and respiratory problems when taken regularly. Nettles are a mild diuretic, an anti-inflammatory, blood purifier (rids the body of toxins), a tonic, and a digestive restorative. If you like your greens you’ll love nettle and that’s a promise. The slight peppery taste is gorgeous and perfect for soup making. Pick the tops of young nettles, remove the stalk and wash.
Wash nettles thoroughly and discard the tougher stalks. Melt the butter in a large pan over medium-low heat, add the onion, carrot, celery and garlic, cover and sweat gently for 10 minutes, stirring a few times, until soft but not brown. Cook the potatoes separately and when almost boiled, (and strained) add to the soup pot with stock. Bring to a simmer and cook for 10 minutes. Add the nettles, stirring them into the stock as they wilt, and simmer for five minutes or so, until the nettles are tender. Season with plenty of salt and pepper. 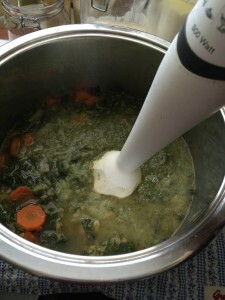 Purée the soup in a liquidiser and return to a clean pot to heat (do not boil) and prepare to serve. Serve in bowls with a dash of cream or crème fraîche and garnish with chives and parsley (optional). Enjoy with fresh homemade sourdough. 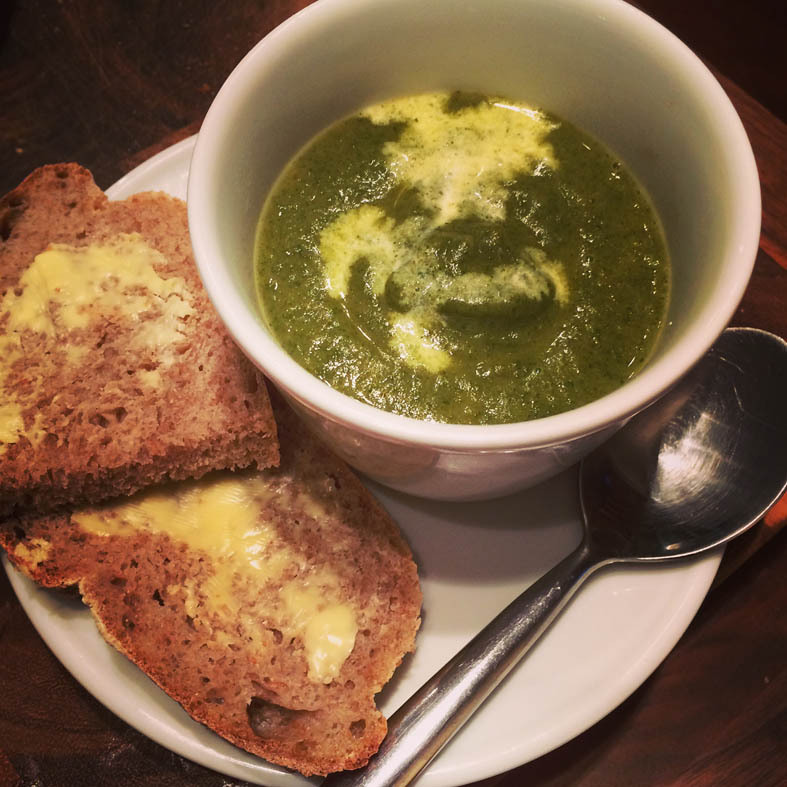 Have you ever tried Nettle Soup? Would you try it now knowing the goodness in it? Let me know in the comments section below.